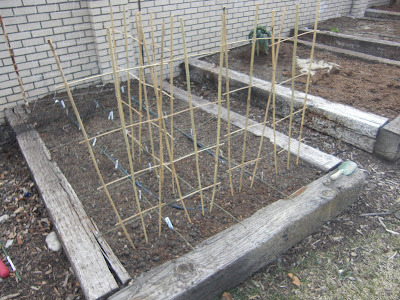 A week ago Saturday, I finally squeezed in some moments to plant my peas, spinach, lettuce and other cold-weather crops. As of yet, there are zero signs of life. I am at a loss. Sometimes when I plant, everything comes up, other times, nothing? The determinate factor has yet to be discovered. I am also giving my raspberries extra TLC this year. In years past, they go crazy but hardly produce. They are now in their 4th year with yet to provide a bounteous harvest. I carefully pruned this year. 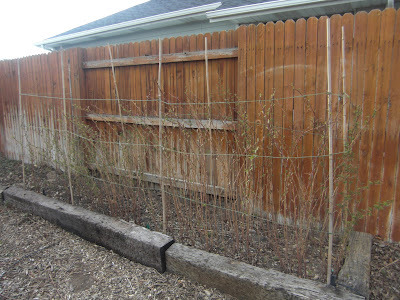 By removing the dead canes, cutting the year-old-canes to under 5 feet, and providing a simple trellis I am hopeful for better results. Last year I mowed them down, in hopes for a large fall crop, it was meager at best. I will keep you posted. I hope you get a good crop...because then I can sneak over to your place and sit in front of your plants and just eat and eat and eat. Just kidding, but if you get lots...feel free to pass a few along to me.